Kueh Dadar Recipe. Kuih Dadar is sometimes called "Nyonya" kueh (Nyonya coconut pancake), was originated by the Malay community back in the old days where you can find it mostly at malay stalls. During the month of Ramadan, Kuih Dadar is also sold at "pasar malam" in Geylang Serai. 1. Combine half of the coconut milk with flour. Add in the egg, green colouring and corn oil; beat mixture till well-combined. 2. Gradually pour in the remaining coconut milk. Continue beating for 5 minutes. 3. Let batter stand for 30 minutes. 4. Heat up an omelette pan. Pour some batter onto pan. 5. Tilt the pan so that the batter is spread evenly thin. When sides turn dry and brittle, remove kuih. 6. Repeat this process till all the batter has been used up. 7. To prepare filling: Fry the grated coconut till just heated up. Add in the dissolved gula melaka and sugar; stir till mixture is well-blended. 8. When cool, spread 2 teaspoonfuls filling in the middle of the kuih. 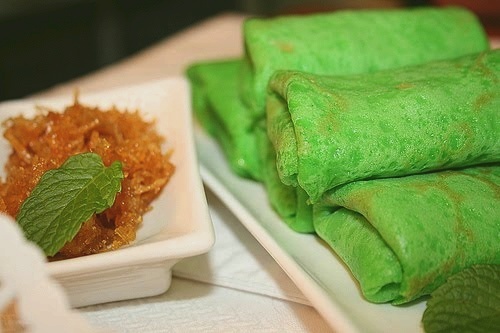 Roll up kuih and serve. Do not grease pan since batter contains oil. Halal Version of Tiramisu for Children! The pictures are beautiful. We make a similar dish in Sri lanka called pancakes. Check my blog torviewtoronto.blogspot.com I put pictures of the pancake we make.